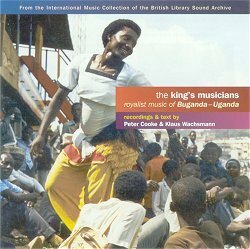 The court of Buganda, which forms the focus for this CD, was abolished in 1966 when the then king, Edward Mutesa II, was forced to flee into exile by the Ugandan Prime Minister, Milton Obote. The palace compound was on Mengo hill near Kampala, and the importance of music is signalled in an early account from John Hanning Speke, who in the mid-19th century reports that he was kept waiting for an audience with the king of the time, Kabaka Mutesa I, while the king was making music with his musicians. Professional musicians at the palace played drums, flutes, lyres, harps, tube fiddles, xylophones, and trumpets. They provided music for daily routines, as well as for feasts, receptions, and ceremonies, and in their spare time they would take their music out to the villages scattered across Buganda. We start with a royal drum and praise shout played by Leewo Sitaata Sozi, once a member of Mutesa's favourite drum ensemble and also the king's personal drummer. This segues into a welcome song given by three performers at a football stadium in Kampala in 1987, when a delirious crowd turned out to see the 'Lord of the Clan Notables', Mutesa's putative successor, Prince Mutebi, who had spent the previous two decades in exile in London. This neatly encapsulates the story of the CD as the musicians fled the palace in 1966, they vowed that the royal music would not sound again until the kingship was restored. Twenty-one years passed until Museveni's National Resistance Army freed southern Uganda from the dictatorial rule of Obote, allowing Mutebi to return. In the interim, we hear stories of imprisonment and loss. Track 7 is particularly poignant, the late Evalisto Muyinda telling a story of two legendary warriors, here reinterpreted to explain the sufferings and difficulties of the Obote period. This track is spoken, but the rest of the album is a glorious concoction of songs and instrumental pieces, juxtaposing superb virtuosic log xylophones with percussive drums, buzzing bow harps, and more. All but one track on the CD was recorded by Peter Cooke. In 1966, Cooke was working as a music educator in Kampala, and some of the recordings were made during his stay in the country, specifically in 1965 and 1967. Cooke revisited the field, and searched out professional musicians formerly employed at the court, in 1987, his recordings from this period providing a further set of tracks for this CD. One further track, of an ennanga (bow harp), was recorded in Edinburgh in 1988, during a visit by Albert Ssempeke. All of this stands witness to the career of a venerable scholar and ethnomusicologist, for Peter Cooke returned from Uganda to take up a teaching and research post at the School of Scottish Studies and the University of Edinburgh, a post that required new research in Shetland (and a book on Shetland fiddling for Cambridge University Press) but which also allowed him to continue his work on Ugandan music. Cooke's devotion to Uganda is legendary, and a number of articles, booklets and recordings later, Topic has allowed him to revisit his materials. The Topic series is issued with the International Music Collection of the British Library Sound Archive (formerly the National Sound Archive, formerly the British Institute of Recorded Sound). Appropriately, then, a further track is added to the CD, recorded in 1949 by the ethnomusicologist Klaus Wachsmann (1907-84). The archive houses Wachsmann's recordings, and in 1949 he had been appointed as curator of the Uganda Museum. Wachsmann's track is Agenda n'omulungi azaawa, a name that translates as 'he who goes with the beautiful one goes forever', a song which a Ganda musicologist has called "the greatest of all Ganda songs; both vocally and instrumentally". Cooke and Wachsmann - two great ethnomusicologists - but rather than scholars in ivory towers, both have proved themselves close to the people, sympathetic to the musicians, and so both endeavour to make the music they record live. We would expect excellent and expansive notes, and we are not disappointed: 22 pages of carefully annotated descriptions, translation of lyrics, and information on rhythms and structures. The recordings themselves are generally excellent, although the older ones lack some of the clarity that we would expect of contemporary digital recordings. No matter, though, since this is more than made up for by the music itself, the explanations, and the stories that lie behind the whole project. Five stars, then, for a tremendous album. And it's available from MT Records.